As the morning passed by the view improved but not a lot. Armed with visas for India and Myanmar I finally left Kathmandu to continue the journey east towards Darjeeling. 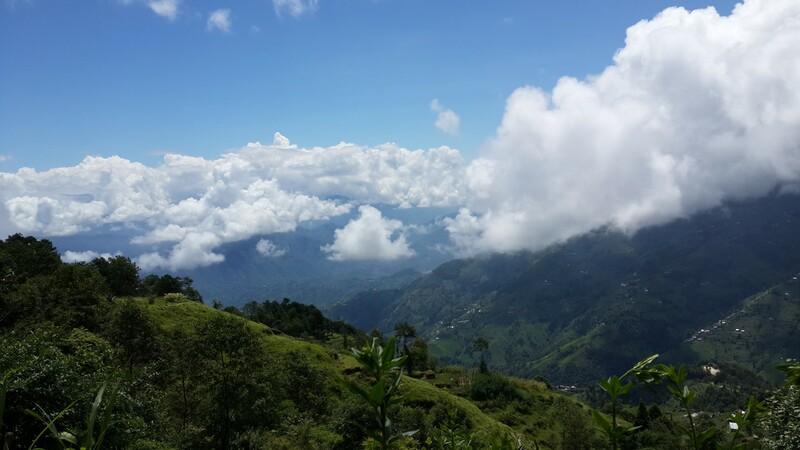 Never keen to travel back down roads already cycled I headed in the direction of Nagarkot, which on a clear day offers views of the Himalaya including Mount Everest. However, during monsoon season clear days are scarce and the Himalaya remained hidden by cloud for the duration of my short stay. 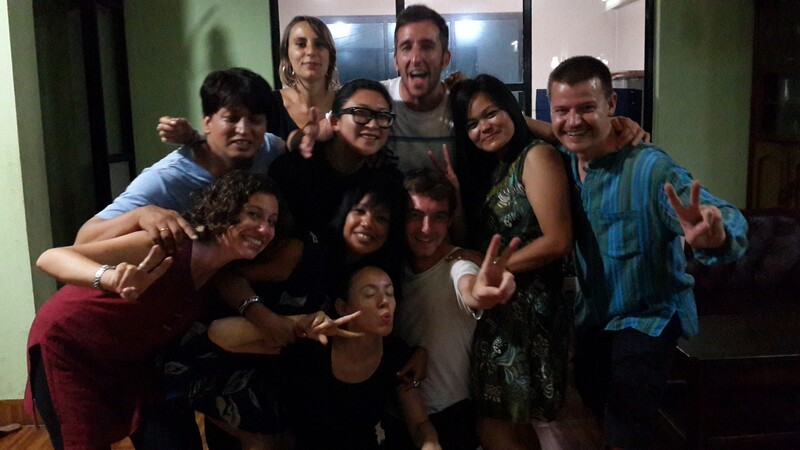 I did enjoy a spontaneous evening with a group of visiting volunteers from Belgium, Italy, Australia and France. We were all swept up in the fervour and enthusiasm of some local Nepalis determined to instigate an intimate dance party. Jolly good fun it was too. The volunteers and the local nepalis. From Nagarkot I cycled back to Bhaktapur and on to Dhulikhel. My plan was to see more of the hills before joining the east-to-west-highway along the Tarai: the lower flat lands of Nepal. From Dhulikhel the road swept downwards through lush green valleys dotted with remotely situated houses, which left me baffled: how do the occupants get to and from their homes? The steepness of the vast pointed ranges loomed overhead dominating the field of view in a magnificent display of might. It was stunning to cycle through and validated the decision to take the road less travelled. 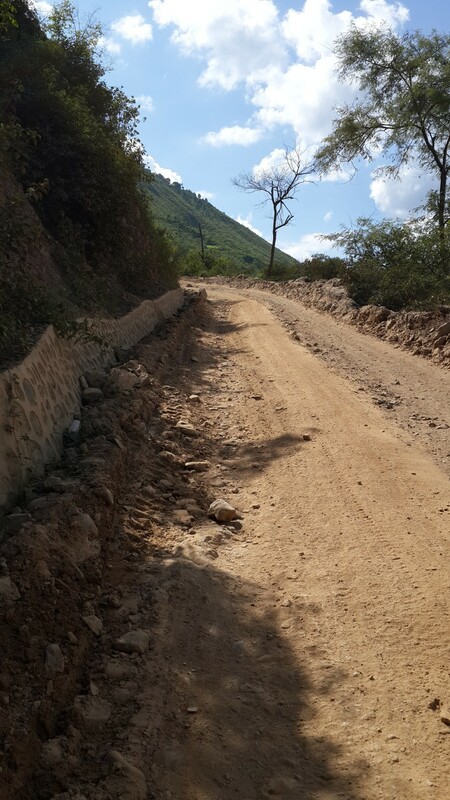 Until I reached Nepalthok where I discovered the Japanese, who had undertaken the challenging task of laying the road, had not yet finished it. In the distance the road is still under construction I was to find. 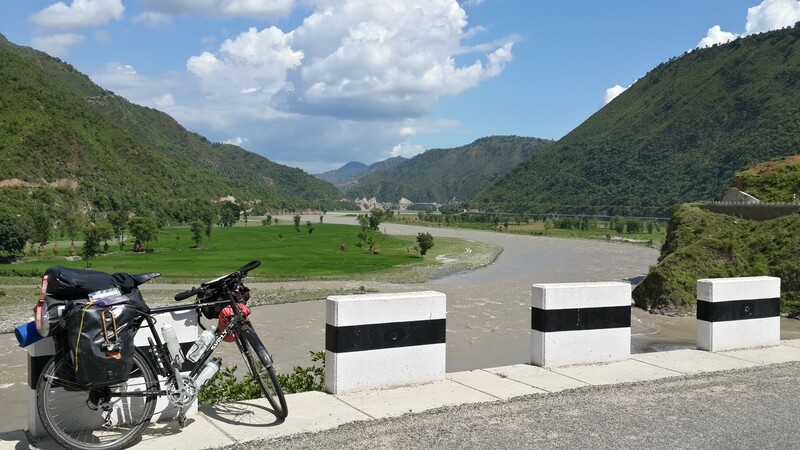 The descent from Dhulikhel to Nepalthok had been a glorious thirty-two miles of bicycle touring heaven. The alternative ‘road’ was an uneven dirt track chiseled into the outside edge of a cliff face. Several attempts to ride and push Shurly Anne up it ended in an unceremonious capsize, which then drenched in sweat, left me coated like a bonbon in chocolate coloured dust. Dirt track to steep to pass. Out of options I stayed the night at a local guesthouse offering a natural pool next to the river as the only bathing facility. A charming place of charming people who looked after me, fed me, and sent me on my way the following day. One-hundred-thirty-five miles cycled through the hills over four days led me back to where I had begun, Thamel, Kathmandu. The road less travelled became the road more travelled than usual, never before had I cycled back along so much of any road thus far. All was not lost, it was during the thirty-two mile climb back up to Dhulikhel, while staring aimlessly at the crack, I noticed Shurly’s bottom bracket had been butchered during the recent service. It was on my return to the bike shop that I met Kathryn and Milan, and the importance of my return to Kathmandu became clear. Incredibly, Kathryn, a visiting teacher from New York, was also a fundraiser for Room to Read, and on seeing my tee shirt introduced herself. 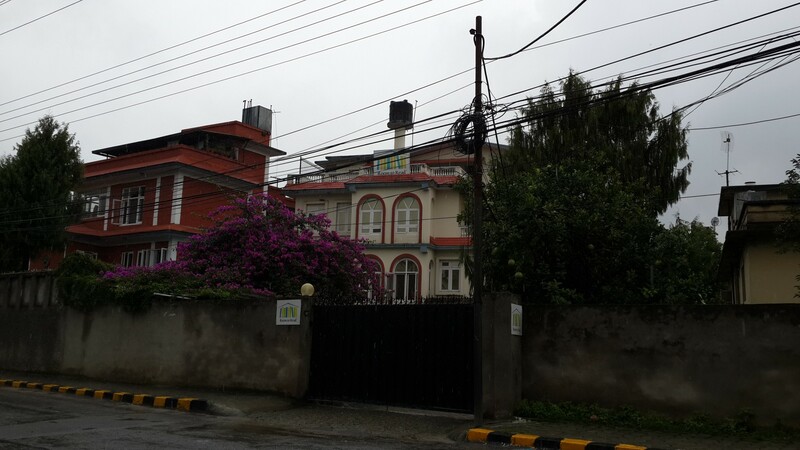 I had made several attempts to find the local Room to Read office in Kathmandu to no avail. However, Kathryn had visited the office on previous trips to Nepal and was keen to introduce me to Rishi, a member of their staff. 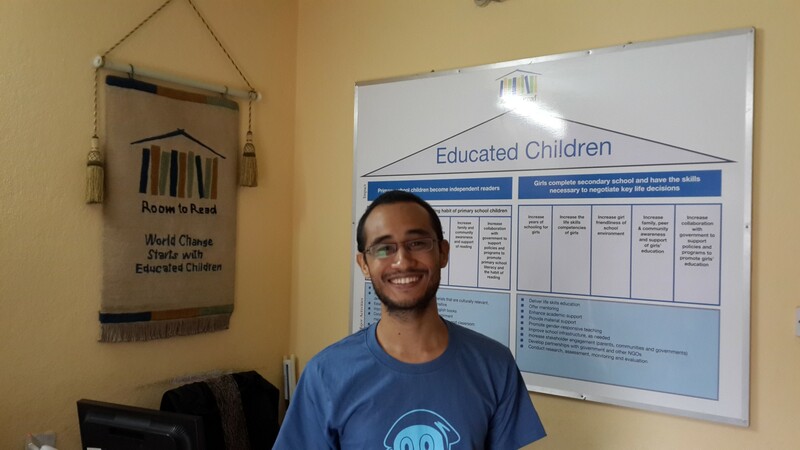 Three days of torrential rain further delayed my departure long enough for me to spend a morning with Rishi learning about how the money raised through Room to Read was transforming education in Nepal. I was blown away by the far reaching impact they have made since the first few hundred books were delivered on horseback in 1998. At that time the charity was called Books for Nepal and later became Room to Read in the year 2000. Especially when you consider that Nepal was wrapped up in civil war from 1996 to 2006. The figures tell only half of the story though. The first books Room to Read supplied were English language books, which although better than no books, still presented an obstacle to learning. When the team in Nepal tried to buy local language children’s books they discovered they did not exist. 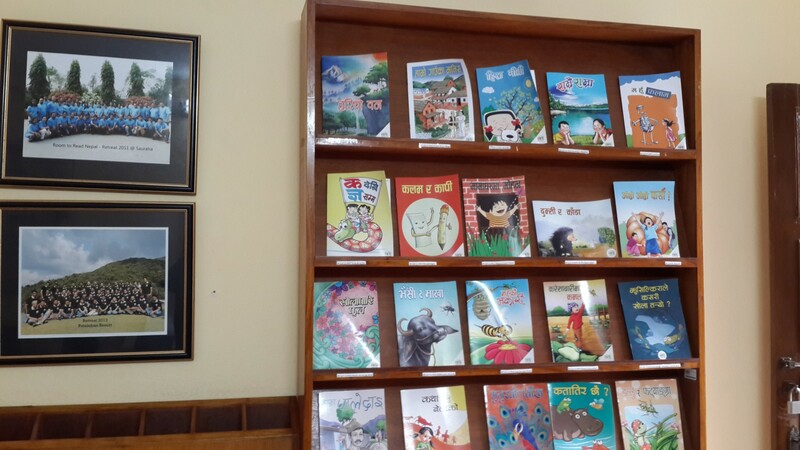 After sourcing local language writers and illustrators to produce the first ever Nepalese children’s books, they were then unable to persuade the only publisher to publish their stock orders. Left with no other choice they took on the role of publisher, and in doing so, started a new industry in local language children’s books. The books are so popular and important to the process of a child becoming literate that they are now supplied to schools operated by the government. Every new title is published in runs of 10,000 to supply each Room to Read library and school, and the government operated schools currently working with Room to Read. The partnership with the government is a key part of the ongoing strategy to improve the literacy of children in Nepal. In addition to providing the books for free Room to Read also delivers teacher training programmes to improve the teaching methods used in government operated schools, to great effect. Room to Read recognises that by sharing the successful practises developed in their own classrooms with the government and other NGOs, their reach is magnified, and the ultimate goal of providing education for all is much more achievable. The ethos of Room to Read is to solve local problems locally with local people. All new libraries and schools are offered to local communities as challenge grants. Meaning: Room to Read challenges the local community to pull together and provide the labour to build and operate the facility, in return for the materials and knowledge to build a new school or library. This has proved to be a very successful model as it hands ownership to the local people whose children will directly benefit from the success of the project. And it’s not only the children that benefit, Room to Read also train the local men and women with the various construction skills required to complete the project, skills which they can then use to gain future employment. The final, and perhaps most important aspect of Room to Reads work, is monitoring and evaluating the impact and effectiveness of their actions. Of the 98 people employed in Nepal only 30 are office based for administration, the remaining 68 are field based, either involved in construction projects, training, or monitoring and evaluation. Incredibly, through this team of people every Room to Read school and library is visited once per week to collect the key tracking data used to quickly establish if the facility is operating to the required standard. Any fall in the number book withdrawals, reading aloud sessions completed or other key metric indicates that a problem may exist. At which time the visiting member of the monitoring staff is responsible for discussing any issues with the staff and getting to the bottom of the problem quickly. The same approach is applied in each of the countries Room to Read operates, and the impact made through the building of schools and libraries, the training of teachers and publishing of books, combined with the continuous research, monitoring and evaluation is evident when you look at their annual report with a difference. The information contained therein is detailed, thorough and transparent. It is also beautifully illustrated and incredibly easy to digest. The global headline figures for the last 12 months continue to show strong growth with the cumulative combined reach directly impacting 8.8 million children. However, Room to Read has it’s sights firmly placed on reaching the remaining 58 million children globally still without access to education. The next short term goal is to increase the reach to 10 million children by the end of next year. My visit to the office in Kathmandu was emotional, partly because I’m a big softy, but mainly because seeing what had been achieved in such a short space of time was inspiring. I felt proud to be raising money for a remarkable organisation capable of making profound change happen. Visiting countries like Nepal and India has often exposed me to disturbing levels of poverty, when in the knowledge that educating children is the most effective way to hack the cycle for future generations, I can think of no better custodian of the cause than Room to Read. Inspired by the visit, all that talk of ‘monitoring and evaluation’ caused me to think about how I could increase the impact of my own fundraising efforts, which to date have been limited to passive donations received from visitors to this blog. I will be adding a new page to the blog in the next few days with the full details. In the meantime if you have any ideas add them in the comments below…. What am I getting myself into? You decide!!!! It is impressive – and very inspiring – to read all that Room to Read has managed to achieve. Feel free to challenge away! !